To fully understand why I train singers, you need to understand my journey from failure to success as a singer. I attended Benton High School in St. Joseph, Missouri. When I was in the 9th grade I went to see our school musical, West Side Story and was so emotionally moved by the performance that an intense desire to learn how to sing and perform in musicals started growing inside me. The spring of my sophomore year, our directors decided they were going to do Camelot the following year. So they took a bus load of students down to Kansas City to see Camelot at Southwest High School. Chuck Gilmore, Arthur; Vickie Albert-King, Guinevere, Ted Markt, Lancelot. Benton High School, St. Joseph, MO, 1970. Camelot Playbill, Southwest High School, Kansas City, MO, 1969. Vickie Albert-King and Chuck Gilmore, Camelot Reception Line. I loved this show and my girlfriend and I decided we would audition for Lancelot and Guinevere. But after we broke up that summer, I felt I could relate much more to Arthur. I understood heartache and tragedy! As good fortune would have it I got the role of King Arthur. My former girlfriend was cast as Guinevere and my best friend was cast as Lancelot! We had an amazing, life changing experience together rehearsing and performing Camelot and the show was a great success. Limited Range and No Vibrato! I didn’t know these were problems I could do something about. In fact, my teacher told me some singers have vibrato and some don’t, and I was one that didn’t. My range wasn’t really an issue either. I was a bass/baritone and so I just sang songs in that range of my voice. Any songs that had anything above E above middle C was for tenors (and was very scary). It was that simple. Inspired by an amazing musical experience in high school I decided to attend BYU as a music major. I was leery about the voice teachers at college. My teacher at home warned me to be careful that someone didn’t ruin my voice. Nothing bad happened with my college teachers, but nothing changed or improved. In fact, my confidence was declining. I was a music major surrounded by very good singers. Chuck Gilmore, LDS Missionary, 1972. I took a two year break and went to California to serve as a missionary for the LDS Church. While serving in California things took a turn for the worse. I sang a solo for the Santa Barbara Ward Christmas program where I was serving. I was awful. I was off pitch and shaky. My confidence plummeted. It only confirmed what I was secretly worried about, maybe I’m not really a soloist…. I’m fine with choir and chorus, but maybe I just don’t have the voice for lead roles and solos. I actually had my journal with me and made an immediate entry into my journal right after I bombed the solo. “Dec 24, 1972, Sunday. I just sang a solo for Sunday School Christmas program. I did what I thought I would-terrible. One of the biggest struggles I’ll ever be faced with is the struggle of gaining confidence while singing a solo-The more I think about it the worse it is-I was so rotten-if somebody tells me it was good they either don’t know anything about music or they’re lying! I don’t even want to look up from writing in this journal because I don’t want to look at the people I just caused to squirm and suffer while I made a fool of myself! “Oh well-I’ve never claimed to be a soloist! Never! …. After experiences like these I wonder what I’m going to do in my life? I sure won’t perform solo’s professionally—how can I direct someone to sing if I can’t do it myself? Unfortunately, I continued to believe this about my voice. Partly due to my insecurity about my singing I changed my major when I returned to school. I sang for 3 more years in the Oratorio Choir in college, performed in “No No Nanette” in a community theater production the summer I graduated from college, and sang in church choir. That’s all I did vocally for the next 19 years! I loved to perform and to be on stage but I lost all confidence in my voice. Although the longing to sing and perform never went away I believed I didn’t have the voice to do it anymore. Chuck Gilmore and Seth Riggs, January 2011. One day in the fall of 1996, my kids brought home a flyer announcing a vocal workshop with Seth Riggs, The Teacher of the Stars, from Los Angeles, CA to be held at the high school…free. My wife, Judy, and 3 oldest daughters, Deborah, Sara and Becca, and I all went to the workshop. I was very impressed with what I saw and heard but I felt skeptical. I thought the singers demonstrating the technique were all born that way. However we signed up for some group voice lessons from a local teacher and began to learn about Speech Level Singing. I’ll quote from a journal entry five months later dated April 11, 1997, Friday. “Since that time several exciting things have happened. First, there is a marked improvement in all our voices. Sara auditioned for the Centerville JHS madrigals…a very competitive situation and made it! What makes it interesting is she had performed for the class several weeks previous and wasn’t too impressive…it was nice …but not very memorable. After her audition Mrs. Cazier said, ‘Your voice has really grown in the last few weeks….a lot!’ She asked if she had been taking voice and wanted to know with whom. I began auditioning for shows again in 1997. Since that time I have been in over 35 semi-professional regional shows. 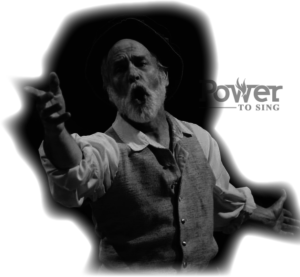 My roles have included Don Quixote (Man of LaMancha), Captain Hook (Peter Pan), Ben Rumson (Paint Your Wagon), Fagin (Oliver), Tin Man (Wizard of Oz), John Dickinson (1776), Duke (Big River) Danvers Carew (Jekyll and Hyde), and many others. I’ve literally sang for 1000’s of people! I’ve been a featured soloist on two CDs; Pilate on the CD “He Lives”, an Easter Cantata by Dean Kaelin, and Jubal on the CD of the original cast of “The White Star” by Doug Stewart (Saturday’s Warrior) and Janice Kapp Perry. I’m not being dramatic when I say all this has changed my life! Having had this experience and journey with my own voice, and feeling the deep fulfillment which has come to me, I want to help you do the same…and preferably early in your search for improvement.